Our robotics program is highly successful and has participated in local, regional, and national competitions. We offer courses that begin with a basic understanding of the world and universe we live in and continue on into classes which encourage and prepare our students for higher education in medical and research-based fields. Our science courses include environmental science, chemistry, human biology, anatomy and physiology, and physics. We offer honors classes in chemistry, physics, and pre-AP biology for students ready to advance their study level further. AP and dual credit courses are being developed by our staff at this time. 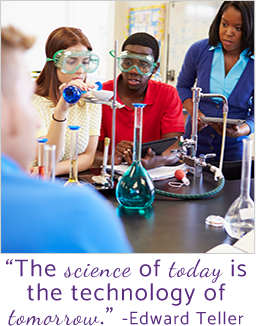 Our science courses are heavily lab-based, and practical application is prominent in the student’s experience. The lab experience will also help many students prepare for careers in lab technician and support positions as well as other technical fields. We believe in assisting our students to be inquisitive and effective problem-solvers. Our expectation is that our courses will not simply help them be successful with AIMS, but will generate a lifelong interest and appreciation of science and technology, while helping them with technical skills and tools that will spur confidence in their career and in their ability to be successful in pursuing higher learning. 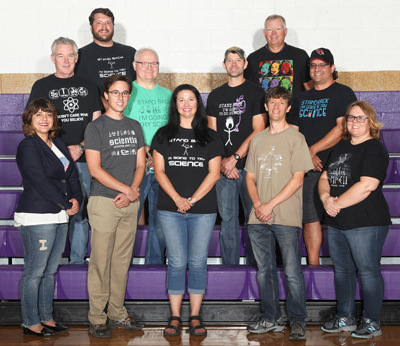 The vision and goal of the Queen Creek Science Department is first to support the Queen Creek High School Mission of providing the atmosphere to foster high achievement in a caring environment. We desire to provide students with the ability, knowledge, and technical skills to enable them to succeed in a college or industrial lab setting. We believe in the vital importance of our students' confidence in their ability to use and utilize the science and technology available in our society today and to provide an education and training that inspire a desire for higher education. Get to know our outstanding science teachers. Find out what makes them so passionate about what they do.